Unbelievably light, unbreakably strong and unmistakably guaranteed, now in a smaller size glass designed to fit most cabinets. Not too big, not too small, just right! Spoil yourself with this luxurious glass, designed to be enjoyed everyday. How do I get a replacement for my Fusion glasses? BEST ANSWER: DJS, Simply call our Glassware Warranty Hotline at 800.648.6058. A friendly Customer Care Representative will assist you with your claim. Thanks! Is the monogram feature available again? I ordered 8 fusion air and had them monogrammed locally and the lady over blasted one. I would have added the monogrammed feature through Wine Enthusiast if so. 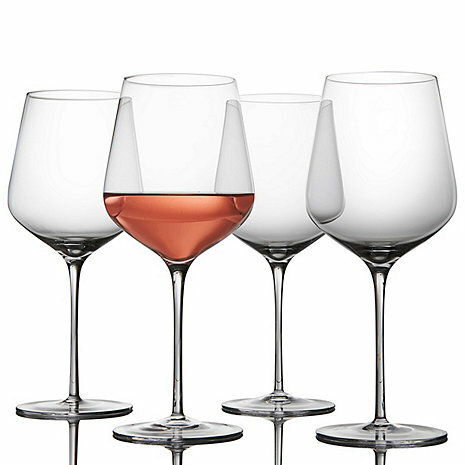 The glasses are elegant looking and look fragile with the thin stem. My son immediately wanted to test it to see if it really would not break so he dropped it. It did not break! Perfect for him and his friends who can go through a set of wine glasses in a month. Unbelievable how light they are. I ordered 2 sets. They are very pretty too! Superior wine drinking glasses. They are super light weight and appear to be of the quality that costs twice as much. Hand hold is excellent. The design allows a wonderful first nose with easy twirling to establish the second nose and resulting legs. Allows a real evaluation of the wine quality. Would definitely recommend. We have eight! Fusion Air Universal Wine Glasses. Excellent service and wine glasses. Great service and delivery time as requested. Very nice wine glasses which were used for our Christmas table. Thanks. 5 star service and glasses. Really like the whole air fusion line of glasses! They have a great feel and ring for toasting! Hoping champagne glasses will be available to complete my collection! Very happy with the Fusion Air Universal wine glasses they are light and beautifully crafted.In appearance they mimic glasses that are much more expensive! These lovely simple wine glasses are a nice everyday glass. They fit nicely in my dishwasher which is a plus. I would however like a stem that is a little more substantial. I have several fusion wine glasses that are about a half inch taller and feel like their stem is easier to hold.